Newport County manager Michael Flynn. Pic: Getty Images. 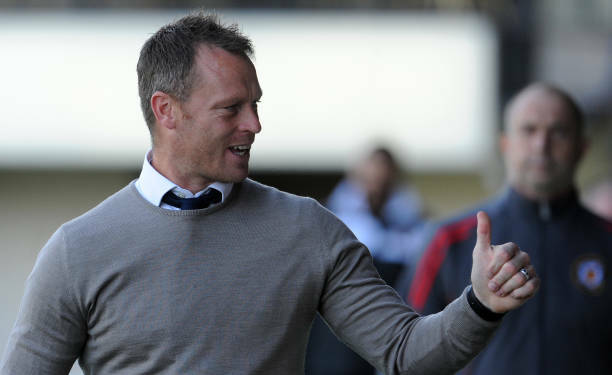 Newport County’s Michael Flynn has been named League Two manager of the month for September. His success was built on impeccable away form with wins at Port Vale, Oldham and Tranmere and County are joint second after taking 12 points from a possible 15 over the month. Dai-sport journalist Terry Phillips looks at Flynn’s Exiles’ journey and his Newport mission. Michael Flynn’s relationship with home city club Newport County has been an emotional rollercoaster. He was dismissed by the club as a teenager, helped them earn promotion back to the Football League and, as manager, was a leading figure in their ‘Great Escape’ fro relegation back to non-League. He is now leading a promotion charge. Flynn grew up in Pill and lived with great-auntie Sheila and great-uncle Ted. They played five-a-side at Pill Leisure Centre and 25-a-side matches on the Pill AFC pitch when ages ranged from teenagers to 50-plus. Newport County’s future player, coach and manager moved on to Civil Service FC, Bettws and then YMCA. The lure of Pill was still there and Flynn returned to his local club, but when he started at St Joseph’s High School it was time for a change from football to rugby for a year. When he left school, Flynn combined part-time football at County with full-time work as a postman. After 18 months he signed for Barry Town, a full-time club, and never looked back in his football career. In 2012, Flynn returned to his beloved Newport and they were promoted to the Football League, returning after 25 years away. Michael Flynn. Pic: Getty Images. Local boy Flynn found himself in trouble during his early days at County when he was dismissed from the Academy for a breach of club rules. He was sacked as a trainee in the morning and handed a first-team break the following day. Flynn scored a hat-trick for Pill’s senior team in the Gwent League. That was reported in the South Wales Argus and spotted by Jones. “Newport were my team, my club and when I was told to leave I was in bits,” recalled Flynn. “I got kicked out of the youth team. Glyn Jones asked me what I had done at the weekend and I told him I played for Pill. “He said ‘I know, I saw in the local paper you scored a hat-trick.’ He kicked me out for breaking his rules. “I had just started working as a postman for Royal Mail and I had been stacking shelves in Tesco in Maesglas. It was a relief. Flynn was ‘heartbroken’ when former England captain Terry Butcher, then manager of the club named him among 11 players released. He moved on to manage Undy FC and was there four months before being asked to return and coach Newport’s first team. “It was hard to leave the club and the city,” said Flynn. “I had to do it to better my career, to better my life. “It’s really difficult to put it into words what it means to me, it is everything. “The togetherness of the city, the good days, the bad times, throughout the years. We have seen the fans of this club come together and drag it back to where it came from again. “The enjoyment on children’s faces when they come to games, seeing them being part of it and become the future fans of the coming years. “The club for me is everything, a lot more than just football. “Being around the club in 2012-13, you just felt it was written for us, that it was in the air,” said Flynn about the season under under manager Justin Edinburgh that ended with promotion at Wembley. “I told everybody in the November that I’d had a dream we would go up via the play-offs. We were top of the league at the time and I’m not sure Justin was happy with me. “Ask the boys in the dressing room, they knew I’d said it. Flynn was preparing to go to bed when he received the phone call asking him to become the club’s third manager in a season which looked certain to end in relegation. “I wasn’t expecting it, but I was prepared,” said Flynn. He had been studying at a Football Association of Wales’ coach education programme with Thierry Henry among his classmates. “I could have easily have stood back, let someone else take it until the end of the season and then perhaps had a chance. But I wanted to meet the challenge head on. “Everybody thought we were relegated and, thankfully, we managed to do the unthinkable and stay up in the last minute. Saving Newport County from relegation meant everything. It was great for myself, my family, my staff, the players and, most of all, the fans of this football club. “They have been through so much. They were out the league for 25 years – so to keep them in the league was huge. Newport County were seven minutes away from relegation to the National League in 2016-17. Rivals Hartlepool were winning and only a last gasp winner against Notts County could save the Exiles. “I was nervous, worried,” said Flynn, who had taken charge of his home city club when they were 11 points from safety with 12 fixtures left. “We’d been terrible second half and there was a point where I thought ‘That’s it’. “I never lost focus and my staff – Lennie Lawrence and Wayne Hatswell – were even calmer than I was. It was a decision which changed the future for County. Full-back O’Brien coolly chested down a right-wing cross after 89 minutes and volleyed spectacularly into the far corner. Newport won 2-1 and stayed up. “It was surreal,” said Flynn. “I went up through the Conference play-offs with Newport, had two automatic promotions with Wigan. “But all the drama, all the suspense with my hometown club…this has to be up there with any of it. It was all the more special because my wife and two of my kids were there. “It was a long shot to stay up, I knew that. But I always believed it was possible. “It was about putting a smile on players’ faces. We went back to basics and helped the players believe in themselves. It was about team spirit and feeling involved. That was desperately needed. “Boys who were injured were in on team meetings. Anything we discussed we did as a whole squad. “Hartlepool were 13 points ahead of us at one point. It was a 15-point swing. That tells you the scale of what they achieved. There was a picture on social media that had Flynn’s face superimposed Steve McQueen’s body when County were battling for their lives in League Two. Flynn breathed new life into a club that barely had a pulse when he was asked to step up from his role as first-team coach to replace Graham Westley. The Exiles came back from the dead. Former Cardiff City manager Lennie Lawrence now coaches alongside Newport County team boss Michael Flynn. Pic: Getty Images. In his first full season of Newport, Flynn guided his club to an 11th-place finish in League Two and to the fourth round of the FA Cup. “I wanted to do the best I could for Newport, but my number one priority was to get Michael the job permanently,” said Lawrence, a veteran of well over 1,000 matches in management. “Initially, he was appointed until the end of the season, but the directors listened to me. Lawrence believes County could survive in League One, saying: “If you get everything absolutely bang on you can survive in League One. “Everybody wants a young manager because they are hoping for the next Alex Ferguson. “With a club like Newport, you have to know what you’re doing and care about it. “It must be more than a job. Michael is a local lad and he played for the club so you’ve got that. “He has a great work ethic and has shown the ability to learn and benefit from experience as he goes on. “He has a foothold and I’ll do the best I can to make sure he does well enough to stay in the job. If he does well he may earn a chance to move to a bigger club. “It’s important in your first job as manager to spend a reasonable amount of time at the club. “It all starts and finishes with man-management. “There’s an old saying in football that, as a manager, you can do what you like with the players during the week, but it’s no good if they don’t play for you on a Saturday. “Young managers have to decide fairly early in their careers if they are a manager who can coach or a coach who can manage. Mike is a manager who can coach. “His man-management is good, he has a business sense, and Newport needs a manager, not a head coach. “He has a work ethic, understands how it all runs and knows Newport better than anybody. Joined Barry Town the following year, scoring 42 goals in two seasons including a Champions League striker during the 3-1 Champions League win against Porto. Barry won two League of Wales titles with Flynn in their squad. Moved to Wigan in 2002-03, made 17 appearances as they won the Division Two title. Wigan earned two promotions while Flynn was at the club. Started 319 matches in the Football League and went on from the subs bench 106 times, scoring 51 goals. Rejoined Newport in 2012-13 when the Exiles qualified for the National League play-offs and won, beating Wrexham 2-0 in the final at Wembley Stadium. Took charge of County’s youth Academy before moving on to become player-manager at Welsh League Undy Athletic in August 2015. Two months later he was appointed Newport first team coach and worked alongside John Sheridan, Warren Feeney and Graham Westley before being named caretaker manager during March 2017 with County 11 points adrift at the bottom of League Two. Remarkably, Flynn’s revitalised team avoided relegation with a win against Notts County in their final match completing the Great Escape. He was appointed long-term County manager during May 2017 and has since signed a contract extension through to 2020. Flynn has been in charge of Newport County for 83 matches, winning 36, drawing 20 and losing 27.